Indian e-commerce giant Flipkart is going be acquired by the world’s largest retailer Walmart. According to the fresh report, Walmart might get hold of 73% of Flipkart which is valued at $16 billion. The US-based retailer is said to have closed the deal on May 3rd spending at least $14.6 billion in the cash-and-stock buyout. Previously, there were reports rumors that Walmart was said to acquire about 40% of Flipkart. 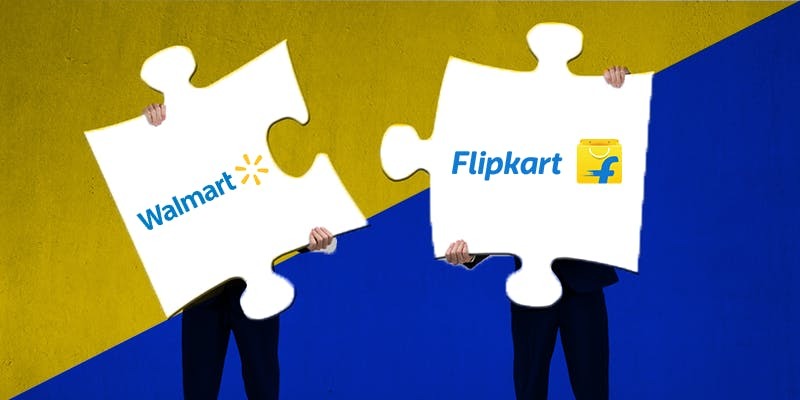 After a couple of weeks, it was again reported that Walmart may acquire 51% stake and now finally the deal has been closed to 73% stake of Flipkart being sold. According to a report by FactorDaily citing one of the sources, Flipkart was valued at $20 billion, but Walmart had put the target company’s value at $22 billion. At this price, Walmart will have to spend more than $16 billion for its 73% stake. Interestingly, another giant company Alphabet, the parent company of Google is also said to make a $3 billion investment in the buyout. The report further states that both the companies have signed tentative agreements after meetings. The sources confirmed that the deal will be a mix of cash and stock as mentioned above. “Cash component will be close to 55%, which will mark the exit of some of the largest investors in Flipkart,” one of the sources said. For management team, the current CEO Krishnamurthy will continue to lead Flipkart. While, Sachin Bansal, the co-founder, and current chairman may exit the company. If we talk about the investors of Flipkart, some of its friendly investors like Tencent, Microsoft, and Tiger Global will not cash out completely after the buyout. While Softbank which currently holds over 20% stake in Flipkart will leave the company and will make $4 billion out of the deal. The report also tells that Walmart has told Flipkart’s board that it intends to sell the shares of the Indian e-com giant in an initial public offer (IPO) in coming three years. The sources further claim that Walmart plans to start food and grocery chains in India. The Flipkart acquisition deal is not official yet as either of the companies haven’t made an announcement. However, it is soon to be official.